DJ, painter, puppeteer and mother Chamindika Wanduragala builds a puppet for an upcoming show in her home. Photo by Annabelle Marcovici. 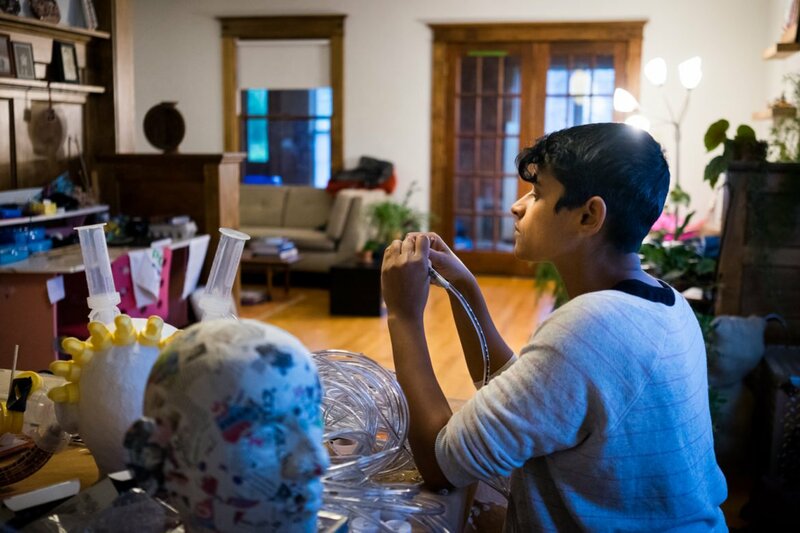 When Sri Lankan artist Chamindika Wanduragala returned to the Twin Cities arts scene after almost a decade away, it was a much needed rebirth. A visual artist by training (having earned a bachelor’s in studio art from the University of Minnesota) and a DJ by night, Wanduragala had taken time off from her practice to raise her two children. Now that they were both in preschool she was eager to start creating again. A lover of music, she picked up her turntables last year, playing events for local art organizations such as Pillsbury House Theatre’s recent Late Night Series. “I just want to share amazing music with people and spread the word about artists that I think deserve to be heard and have their music supported,” she said. And Wanduragala is doing just that. Take for instance her August gig held in South Minneapolis’ Reverie Cafe + Bar where she invited local musicians to perform live vocals over dub instrumentals. “I did this DJ night called Crucial Excursions to spread the word about contemporary roots reggae artists because they don’t get played here. I was playing that and in between I had dub instrumentals with Queen Drea, Ritika [Ganguly] who is Bengali and Aida [Shahghasemi], an Iranian American musician who sings in a classical Persian style to contemporary music. Each of them were given three instrumental tracks that they did vocals on top of and performed live,” she said. Aside from playing music, Wanduragala also returned to drawing. In July she was invited by fellow artist, Pramila Vasudevan to take part in Soap Factory’s 3 x 5 ARTIST Residency Program. The exhibit featured her visual artwork which she describes as, “what writer and activist Audre Lorde referred to as biomythography: the intertwining of experience and history with personal mythology,” she said. But there was still something lacking despite the vibrancy of her work. “I always wanted to bring my drawings to life,” Wanduragala says, “but didn’t have the time to make that happen. Now that I have time because my youngest [child] is in preschool, I’m bringing my characters to life,” she said. How does Wanduragala bring her “characters to life?” Through puppetry. Chimandika Wanduragala. Photo by Annabelle Marcovici. “I think that we’re raised in a society to have a focus on one thing and I just don’t think that’s true. I think you can be good at a bunch of different things and different things can inform all the things you do too,” she said. In August, Wanduragala decided to try her hand at puppetry. But she didn’t do it alone, instead she founded the Monkeybear’s Harmolodic Workshop. Through the workshop, she was able to invite 22 Native artists and artists of color to a seven-day intensive puppet workshop where, together, they “learned the basics and fundamentals of performing puppetry,” from master puppeteer Andrew Kim (formerly based in Minneapolis). No stranger to creating space for artists of color to grow and showcase their work, Wanduragala co-founded Diaspora Flow in the early 2000’s; a multidisciplinary arts organization whose aim is to connect artists of color with audiences of color. With Monkeybear, Wanduragala wanted to create opportunities for artists to develop the skills and artistry required for puppetry. “The point of it is to nurture native artists and artists of color in contemporary puppeteering, a field that is really white in the United States. What kind of aesthetics in contemporary puppeteering will emerge when there are more artists of color or native artists participating? How will the aesthetics change? It’s about what’s to come. They’re going to evolve the form because they’re just getting into it and exploring,” she said. Based off the success of the initial workshop with Kim, Wanduragala is developing new programming through Monkeybear. In December, she will be offering a shadow puppetry class and in January 2017, Monkeybear hopes to launch a commissioning project that will give artists the chance to produce short five-minute pieces and receive feedback on their work. “They get to go through the full range of experiences of creating a show but it’s not too daunting of a task since they’re just starting out. Then each of the artists will [also] have a work sample so they can apply for other things,” she said. Wanduragala’s experience as an emerging puppeteer is helpful in guiding the process of developing workshops for others. “Because I’m also beginning it helps in how I’m organizing. I’m also going through the same thing with everyone that’s participating,” she said. But Monkeybear is not Wanduragala’s only foray into the puppetry world. On the heels of her successful August workshop with Monkeybear, she was selected to participate in the Heart of the Beast Puppet and Mask Theatre’s 2016-2017 Puppet Lab program. The program selects emerging Minnesota artists each year to support in “the creation and presentation of new and experimental work,” she said. Each artist receives an artistic director who guides them in developing their individual works, which will be shown in March 2017. The artists also meet as a cohort twice a month to share their progress and receive feedback on their works-in-progress. Of the four artists selected for 2016-2017, Wanduragala is the only artist without a puppetry background. “Having to create a show for the first time when all the others have been in the puppetry world and have worked on stuff, I’m excited and scared. I think it’s good to push yourself and not always be in that comfortable space of creating,” she said. Wanduragala’s show will be a reflection on the last eight years of her life, being both an artist and a mother. Her work wants to explore the tension between the two identities: the sacrifices that new mothers are required to make; how daily routines can be both filled with love and consuming dullness; what passions stay and which ones get set aside. Supplies for Wanduragala’s breast pump puppet. Photo by Annabelle Marcovici. “It’s these vignettes – almost kinda nightmares – and a few [other] scenes. There’s this breast pump puppet [made from parts of her and other mothers’ breast pumps]. I really hated pumping and I think all mamas hate that. That sucking sound [of pumping] is going to be the soundscape for the evil puppet. Kind of playing around with what are the things that frustrated me the most in those times. That sense of feeling frustrated and resentment over not having time for myself and then how I end up being able to get back to that,” she said. 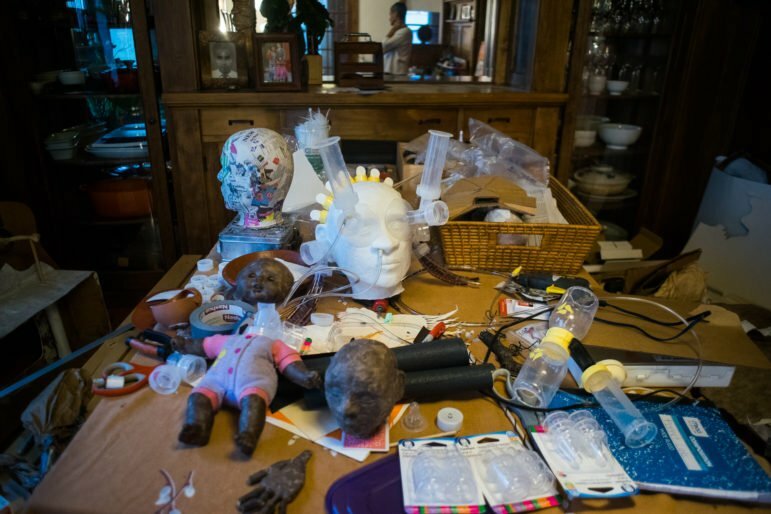 While she finds puppetry invigorating, it is not without its challenges as she moves from drawing her characters to “bringing them to life,” she said. “Now that I’ve actually started making, I’ve realized that the hard part for me will be the performative part. Because I’m a visual artist, thinking about how the puppet looks and making it is super fun and I can make something look good. But then performing it and making a story out of it, that’s the hard part. But the good thing about puppetry is that you don’t need to be a performer, it’s not really about you,” she said. 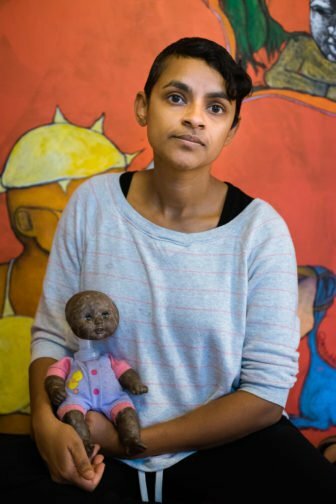 Wanduragala hopes that through her experience with Puppet Lab and her Monkeybear’s Harmolodic Workshop, she can encourage greater participation of Native artists and artists of color in the local puppetry scene. She understands intimately that “making it” as a native artist or artist of color in a predominantly white arts scene has its barriers and challenges, which is what pushes her to nurture other artists. Since her return, she has noticed some positive changes but for Wanduragala, acquiring funding still remains a huge barrier to success for native artists and artists of color. “It’s definitely a little better than 10 years ago but I still see the same frustrations and the same processes. Not that much has changed in how grantmaking and funding is done. Yes, there are more artists of color getting grants but there are so many artists who are doing great work and providing platforms for other artists and they feel really intimidated by the grant writing process,” she said. For Wanduragala, grantmaking (for both artists and arts organizations) needs reform from the Minnesota State Arts Board down to smaller funders. Among her suggestions for reform, are language that is accessible to all applicants and not geared towards individuals and organizations with grant writing skills. Another key change could also be made in the grantmaking panels where people of color and native persons are greatly lacking. Which means that ideas or projects that communities of color have may not always be understood or given as much weight as the white artists who panels can easily identify with. But for all the work to be done, Wanduragala celebrates the improvements she sees, some encouraged by social media. In 2001, when she formed Diaspora Flow, a common complaint for artists of color was that they didn’t get to show their work to their communities. Not so anymore. She has witnessed a demographic change in the Twin Cities arts scene that has allowed for more organizers who are either native or artists of color, leading to larger audiences and art consumers of color. In addition, she is seeing more artists of color both producing their own work and presenting other underrepresented artists. “I also support other people’s work and that forms a nice community,” she states, “but I do think it’s important to push yourself and get new people to come to you work, to connect with other people. You want it to be more than just other artists coming to see things,” she said. Soap Factory continues to serve artists. Love this story. So glad I got to be one of many who made it happen.